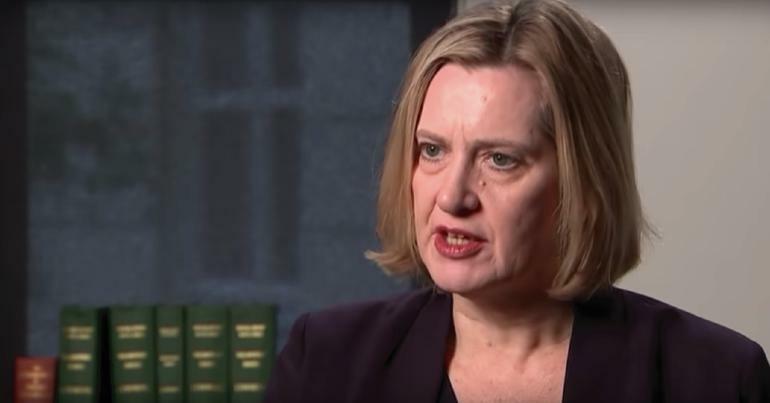 Amber Rudd has been appointed as the new boss at the Department for Work and Pensions (DWP) following Esther McVey’s resignation over Brexit. 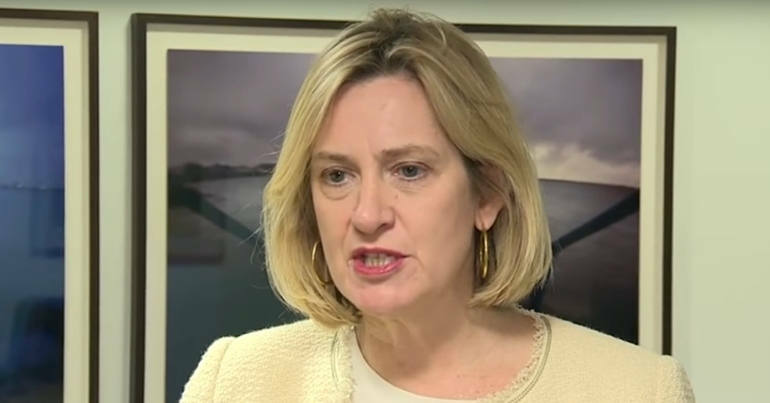 Rudd resigned as home secretary last April for misleading Parliament over deportation targets. Apparently, six months was long enough on the backbenches, and she’s now back in another high-profile ministerial position. You get people who are on benefits, who prefer to be on benefits by the seaside. They’re not moving down here to get a job, they’re moving down here to have easier access to friends and drugs and drink. Rudd herself was born into a somewhat easier life than many of those in Hastings. She was educated at the exclusive Cheltenham Ladies’ College (fees currently nearly £37,000 a year for boarders) and was once employed as the “aristocracy coordinator” on the film Four Weddings and a Funeral. And her voting record reflects her inability to comprehend life for people less fortunate than herself. She voted consistently for government cuts to welfare benefits, including supporting the bedroom tax. She also voted consistently against paying higher benefits to those unable to work due to illness or disability. In June 2018, the National Audit Office (NAO) reported on the rollout of Universal Credit (UC). One of the five areas the NAO studied was Hastings. The report found that there was an 80% increase in demand at Hastings foodbank since the rollout of UC. A further issue for claimants was the difficulty in finding rented accommodation: a local property agent told NAO investigators that only one in ten private landlords using their agency would rent to benefit claimants. Rudd is happy to ignore the solid evidence of the disaster that is UC, saying in an interview after her appointment as DWP secretary that she had seen UC “transform lives” in Hastings. Which is certainly true, but perhaps not in the way she meant. I believe this is a great service for those most in need. 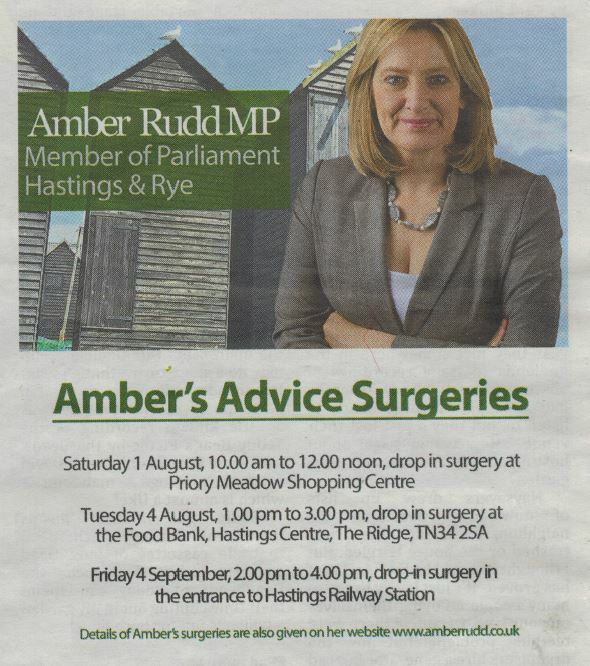 Rudd actually used to hold constituency surgeries at the foodbank. Which makes a lot of sense if you want to meet the people most affected by your own policies. Someone must have suggested though that this might not be the savviest PR move. Now she holds all her surgeries in her office in an inaccessible industrial estate in the town. Almost every week, you can find Rudd in the Hastings Observer – glad-handing people at charity auctions, smiling in front of street collections or campaigning for some good cause or other. She’s apparently able to ignore the fact that most of the causes she supports have been negatively affected by her government’s policies. Recently she’s been campaigning to save our local walk-in centre which the Clinical Commissioning Group wants to move to the local hospital (three miles and a £4.30 bus ride away up an enormous hill) in order to save money. She’s also spoken out about the closure of toilets in the town centre, by a Labour council which has seen massive cuts to its budget in recent years. She has called the deaths of three homeless people in Hastings last winter “a tragedy”, ignoring the fact that the number of rough sleepers has risen every year since her government came to power. She’s praised the work of the local day centre for homeless people, without mentioning that the centre lost £48,000 in funding because of cuts to the county council budget. In her seven years in Hastings, Amber Rudd has shown herself to be utterly uncaring about those less fortunate than herself. She simply cannot bring herself to have an ounce of empathy, despite being MP for one of the most deprived towns in England. She’s going to make the perfect DWP secretary.